Just over 200 years ago, the famed British composer and astronomer Sir William Herschel discovered infrared (IR) radiation. Today, test tools using Herschel's infrared discovery enable technicians in many fields—electricians; plant technicians; heating, ventilation and plumbing contractors; and automotive technicians—to detect and fix problems otherwise invisible. Now a new innovation, the Fluke VT02 Visual Thermometer—developed with British innovator Infrared Integrated Systems Ltd. (Irisys)—is bringing affordable infrared testing to technicians who once had to choose between limited IR thermometers and costly thermal imagers. Early infrared sensors detected infrared radiation using single element detectors, and created line images. The military learned to use these infrared images to see targets, even in darkness or smoke. But these early infrared sensors were costly, and some types had to be actively cooled to function. A new type of uncooled sensor, the microbolometer, was developed in the late 1980s. Now thermal imagers could be built small enough to be handheld, at a cost more users could afford. Today thermography is widely used. Firefighters use it to see through smoke. 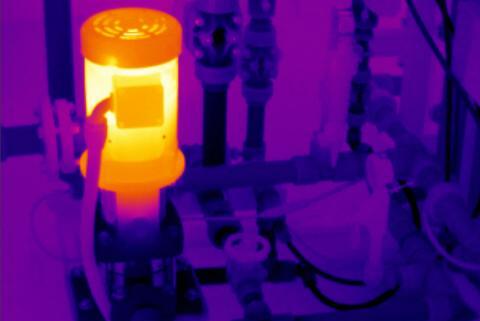 Installation and maintenance technicians use thermography to detect faults in electrical, mechanical, and steam systems. Building analysts detect air leaks and insulation faults. In the second quarter of 2012, Fluke Corporation, a world leader in calibration and handheld test instruments, acquired the privately-held British firm Infrared Integrated Systems Ltd. (Irisys) to enhance the company's R&D capabilities in thermography. Founded in 1996, award-winning Irisys is based near Northampton in the UK. The company invests a double-digit percentage of revenues in R&D and holds more than 70 patents. One in six employees and one in three on the R&D team has a PhD. Both firms have a long record of innovation in thermography. 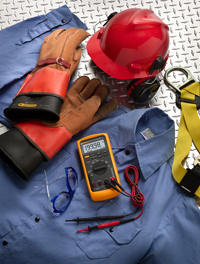 Fluke, world famous for the durability of its test tools, offers both tough infrared thermometers and a line of thermal imagers designed for extreme field use. Irisys used its expertise with infrared sensors and software to create the field of “queue management,” using heat sensors to count gathering customers and software to predict their likely behavior. Irisys systems signal retailers and service firms to add service staff when queues grow long, or reassign staff to other tasks when lines are short. The result: greater productivity and happier customers. “No-one asked us to invent queue management, said Irisys Technical Director Lindsay Galloway. “We came up with the concept because we developed the technologies and saw a new way to use them. Then we asked our customers, if we could do this for you, would you buy it?” The answer was yes, and Irisys still dominates the international queue management industry. Today Irisys continues developing new ways to use thermography, with innovations in security, healthcare applications, and industrial diagnostics. With the new Fluke VT02 visual thermometer, the two firms have created a thermography tool that sets a new standard in performance per dollar, and puts thermography in the hands of a broad new group of technicians. Until now, infrared testers were divided into two categories: infrared thermometers and thermal imagers. The low-cost (<£75) answer was the infrared “point and shoot” thermometer, which measures the average surface temperature of a “spot” that varies in size depending on the specification of the thermometer and its distance from the target. Like other infrared testers, these deliver the advantage of safety (taking readings from a safe distance). They require little or no training to master, and they are inexpensive enough to provide one to nearly every technician. But there are disadvantages. Taking a detailed temperature profile of a system requires the tech to see and write down multiple temperature readings and record where they were made. In addition, it's hard to know exactly how large an area or “spot” the sensor is “seeing” and measuring. Thermal imagers provide far more detail and sophistication—at a price. A single image can provide hundreds or thousands of individual temperature readings, one for every pixel in view. These pixels display a “heat map” that makes for rapid identification of hot spot problems. Some imagers make it possible to blend thermal and visible light images, making it easier to locate a problem. These images can be recorded, and processed for viewing using software. But it takes considerable training to get the most from a thermal imager, and its cost (>£1500) means most shops will have only one. 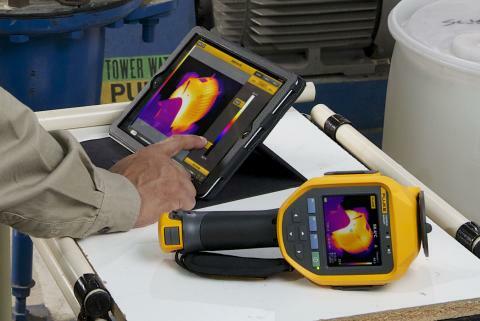 In some industry segments, such as heating, ventilation, air conditioning, and refrigeration, the cost and training requirements have prevented many from adding a thermal imager to their portfolio. Shops that face the impending departure of many senior technicians may resist investing in thermography training for their replacements. Yet the value of infrared testing is unquestioned. The answer: a new kind of infrared tester, the visual thermometer. To fill the space between the two infrared technologies, Fluke set out to design a product to provide quick, easy temperature readings in a visual context—one affordable enough that every technician on a team could have one with him at all times. Traditional thermal imaging technology was not the answer. Thermal imaging is based on the microbolometer, which requires vacuum sealing and very precise manufacturing that makes it too expensive for this type of application. Meeting the goals of affordability and ease of use something new. Pyroelectric technology costs much less to manufacture than a microbolometer, but getting it to form a thermal image was a challenge. The most common use of pyroelectric technology is in motion sensors, like those used in Irisys queue management systems. But rather than creating a thermal image, Wheatley said, signals from queue management sensors detect changes in temperature, and drive sophisticated artificial intelligence algorithms that help merchants respond to customer activity. For the Fluke VT02, Irisys developed a unique hyper-thin film on which it can manufacture an array of elements dense enough to create an image. This is the engine that drives the Fluke VT02 Visual Infrared Thermometer. Its multiple pyroelectric sensors enable the Fluke VT02 to deliver far more than a single temperature reading. The user sees a thermal map of the test area that shows exactly where the hot and/or cold areas are. The tester shows the temperature at the center crosshairs, and the hottest and coldest spots in the image are marked. In addition, the Fluke VT02 can record a visible light image of the test area. By combining the thermal and visual views, the technician can make it clear exactly where the thermal image is recorded—and where any maintenance issue can be found. It's essential to see the problem, but may be even more important to document your discovery and report the solution to your boss or your customer. That's where Fluke SmartView® Thermal Imaging Analysis and Reporting Software proves so valuable. The Fluke VT02 is shipped with SmartView software, a proven suite of tools to view, optimize, annotate and analyze thermal images. With SmartView the technician can generate fully customized, professional reports in a few easy steps. It's easy to use for customers with basic needs, yet delivers the performance that advanced users demand. All future software upgrades are included. The Fluke VT02 Visual Thermometer makes a powerful set of capabilities available to many who thought such sophisticated infrared testing was out of reach. Many technicians have known about thermography and wanted a thermal imager, but just could not justify the capital investment required, or spare the time for the training needed to get maximum value from an imager. If such a tool was available, was likely reserved for use by a trained plant engineer. “This is really placing the ability to do thermal analysis into the hands of tradesmen,” said Wheatley. For professionals like these it's a new day for infrared testing. That day dawns with the Fluke VT02.